!!! 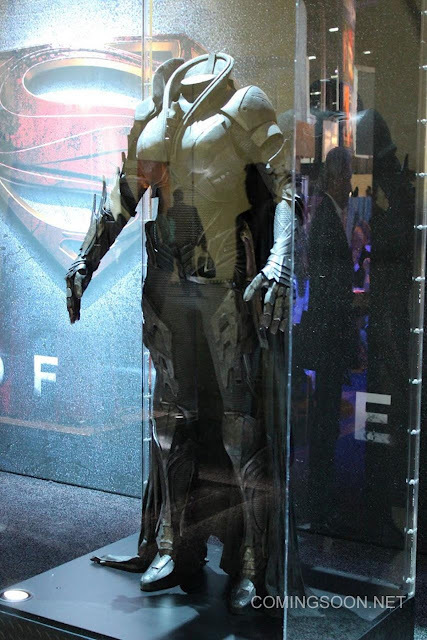 Boy, Those Superman Underoos Make You Look Fat (Man Of Steel AndTransformers News) !!! I went to Krypton and all I got was this lousy cape!?! The Licensing Expo 2012 is taking place in Las Vegas the week and the studios are pushing the merchandising world hard to support their upcoming slate of films in an effort to bring about world peace (actually they just want to make a lot of money, peace is secondary). There are a lot of posters of upcoming movie that basically just show the name of the movie and nothing else. Rarely, you might have a studio bring props or costumes from a highly anticipated big budget bonanza to whet the appetite of the companies with deep pockets. Such is the case with this years expo, because Warner Bros. has pulled out the big guns too woo said merchandise pushers to license it come next summer. What is the said movie, you might ask? None other than Zack Snyder and Christopher Nolan's Superman reboot "Man of Steel". Check out these suckers. 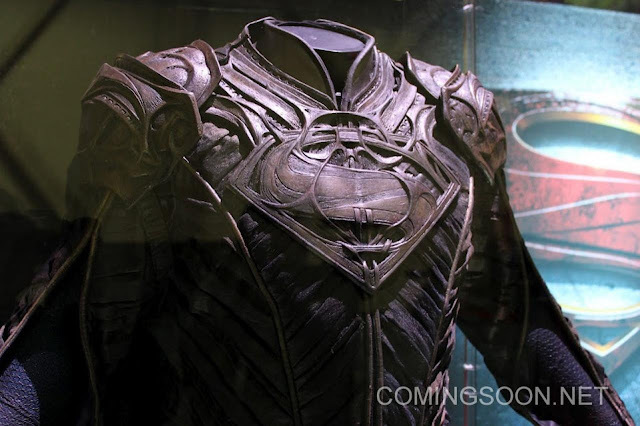 They brought "the suit" (Superman's in case you are slow on the uptake), Jor-El's duds, and the as yet unknown character Faora's costume. Interesting to say the least. 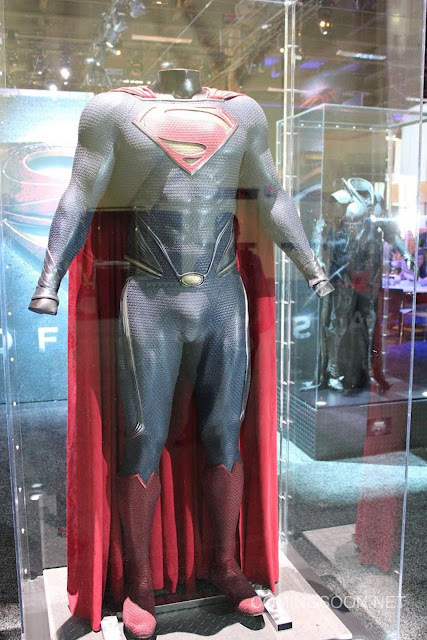 The iconic Superman Suit has changed quit a bit since Christopher Reeves put one on in Richard Donner's 1978 version. For you comic fans out there, you will already be familiar with the absences of the red underwear that the character has worn for 73 years, since DC Comics did away with them for their universe wide reboot "The New 52". I'm still on the fence about this movie because on the one hand I love Christopher Nolan's take on Batman and Zack Snyder's ability to take a comic book and put it on screen, but I don't want a darker more edgy Superman (Batman doesn't call him a boy scout for nothing) and I don't like the fact that they are ignoring the past movies. They may surprise me and that certainly has happened before, but call me old fashioned, because I want my Superman to be about Truth, Justice, and the American Way. Batman is the Dark Knight (I'll post my review of "Rises" after I see the movie), Superman is the Man of Tomorrow, that's just how it is. Don't screw this up Warner Bros. (like you screwed up Green Lantern). Check out all the coverage of the expo on Comingsoon.net. Also, in video games news, Peter Cullen and Gregg Berger are in Transformers : Fall of Cybertron. The two will voice the characters that they made famous in the G1 Transformer animated series in the 80's, Optimus Prime and Grimlock respectively. You can find more info "here". Well, go on people. Get to getting. Todd "I Had Robin Underoos" B. Posted on June 14, 2012 by Todd Blanchard and tagged Batman Christopher Nolan Dark Knight Fall of Cybertron Jor-El Man of Steel Richard Donner Superman Zack Snyder movies news transformers.